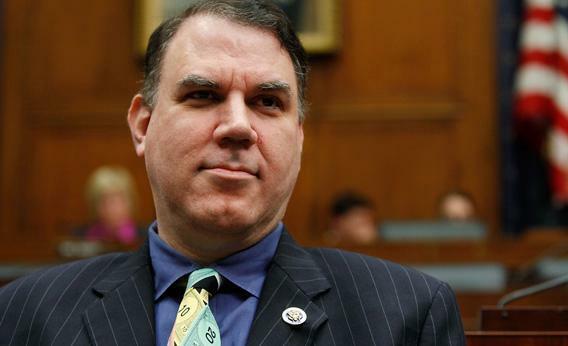 Why Alan Grayson is now the most effective member of the House. Rep. Alan Grayson has focused on passing amendments in his return to Congress. Grayson, once again, had walked under the radar. The Democratic congressman from Orlando had convinced the Republican-run committee to adopt five of his amendments. One would bar “the federal government from awarding contracts to corporations convicted of fraud,” and another would force NASA to “consider American public-private partnership human space flight” before it partnered with foreign space programs. Each was getting him closer to an unheralded title: The congressman who’s passed more amendments than any of his 434 peers. The new strategy is simple. Grayson and his staff scan the bills that come out of the majority. They scan amendments that passed in previous Congresses but died at some point along the way. They resurrect or mold bills that can appeal to the libertarian streak in the GOP, and Grayson lobbies his colleagues personally. That’s how he attached a ban on funding for “unmanned aerial vehicles,” i.e. drones, to the homeland security bill. He swears that they don’t back away from him because of his old persona—well, his relationship with Webster is “strained,” but he points out that Webster won re-election by 5,000 votes and Grayson won with 70,000. Never mind that. Are the members of Congress more forgiving than members of the press? Does any of it matter? The Obama administration doesn’t talk to him about these amendments, and he doesn’t clear anything by it. The most high-profile progressive move Grayson made all year was a letter he co-wrote with California freshman Mark Takano, pledging to “vote against any and every cut to Medicare, Medicaid, or Social Security benefits” in a theoretical sequestration fix. Democrats never got the chance to act on that threat, because, paradoxically, the Republican House’s inability to cut big deals has kept entitlements off the block. Grayson has usually benefited from the way the House is run. His losses have been close-run things. At the end of June, when the House was moving a pair of energy bills, Grayson tried to attach language to enshrine “the right of any state to prohibit the management, leasing, developing, or use of lands” for offshore drilling. He nearly had the votes—one of the amendments failed on a rare 213-213 tie. “I can only imagine what they offered people to switch,” he says. He got close by selling Republicans on the enviro-friendly amendment as a defense of state’s rights. Halfway through our conversation, Grayson has to trek from his office to the House floor for a series of votes. He disappears into the chamber, emerging after almost everybody else. On the way out he spots Florida Rep. Trey Radel, a 37-year-old freshman who that morning had written an op-ed about his love for hip-hop. “I need to talk to you when you have a moment,” says Grayson.